This is a selection from my new e-book “Studying Abroad with Food Allergies,” available exclusively on Amazon Kindle. I detail all the important things you should think about when planning, traveling, and studying abroad! Buy it here. University Programs. These programs are like year-long exchange programs where you are considered a normal student at the foreign university. You typically live on (or near) campus in university-provided housing, but homestays might be an option. Depending upon the country or university, classes may be taught in the native language. Research / Experience Programs. These programs typically integrate a research or internship. Students may take classes and then complete an internship or complete both concurrently. These may be affiliated with universities, but are not always. Housing may be a homestay. Language Immersion Programs. These programs are usually not affiliated with universities and are instead independent institutes. Housing is typically a homestay and academic curriculum is taught in another language. Exchange Programs. These are year-long programs where, like university programs, you are considered a normal student at the foreign university. Exchange programs “switch” students from the respective universities: a university in Japan will send two students and receive two students for the whole year. I have friends that were in each of those different programs. I was on a university program (more on that soon). One of my close friends, Kieran, was in an experience program in Brussels where he lived in a homestay with a local Belgian family, took classes for 5 weeks, and then worked for 5 weeks at a local international security think tank. I have two other friends who were on a university program in southern France, but in a homestay. I have a friend who was on a Mandarin immersion program in Beijing. I also have a friend who was on an exchange program to Japan, and another on an American research program in Chile. There is such a wide variety! DU partners with programs around the world. One of the reasons we have such a high participation rate is because of these partner programs. DU students pay the university normal tuition, fees, and housing costs and DU helps cover all of the associated costs of registering, applying, and housing costs at partner programs. More importantly, if a student has a 3.0 GPA or higher and studies abroad in their junior or senior year, they qualify for a scholarship program that covers visa fees and flight costs! This scholarship is called the Cherrington Global Scholars Program. Most universities have an office for study abroad: at DU, ours is the Office of International Education (OIE). OIE has an easily navigable site that lists out all of the available programs and their requirements. Some programs might have a language requirement or minimum GPAs or even certain majors! For example, there is a program in Milan that is specifically for opera majors at DU. These were some of the criteria I considered when I was selecting my program for study abroad. They at least help narrow down from a wide variety of programs that exist in the world and that DU partners with. Are you comfortable studying in a country where English an official or primary language? Do you speak a second language? Does the program offer credits toward my major or minor? What kind of housing does the program offer? What kind of housing are you genuinely comfortable living in for at least four months? Is the local cuisine (relatively) safe? Is this actually where you want to go? For me, I immediately knew that I would not be comfortable in a country where English isn’t a primary language. I can butcher some Spanish, but I wasn’t comfortable living in a Spanish-speaking country or communicating in Spanish. Study abroad is supposed to be uncomfortable and it is supposed to stretch your boundaries, but it isn’t supposed to be dangerous. I didn’t feel safe constantly communicating in Spanish or in a Spanish-speaking country since I wasn’t sure if I could constantly maintain food safety for the many months I would be there. This also relates to another criterion mentioned above: is the local cuisine (relatively) safe? It’s impossible to find any cuisine that won’t contain at least one of my allergens, so I was looking for cultural cuisine that I could, on average, feel comfortable in finding a safe option. This criterion eliminated some English-speaking programs in English-speaking countries like The Gambia because I wasn’t entirely sure if I could consistently have safe food. Even though I wasn’t considering China, Japan, or Thailand by this point, this would also have eliminated those countries from my consideration. I eventually narrowed down to mostly a few host nations: New Zealand, Australia, the United Kingdom, and Ireland. I also kept the Netherlands, Denmark, and Sweden on my radar because of their high-rate of English proficiency and relatively accessible cuisine. This narrowing process may be different for you depending upon your food allergies. It might be stricter and you might focus exclusively on European countries (or only one country); it also might be less strict depending upon what you need to manage. Conduct some Google searches to explore different country’s cuisines and their languages. This was immensely useful to me before I started to explore programs in-depth. That way, I didn’t go chasing an impossible program down a rabbit hole. Lancaster Castle – at the University of Lancaster where I went! Most of the programs were university programs and I double checked that they at least offered some classes I could count toward my academic degree. Sometimes, students forget that it is study abroad and not travel abroad. This is still an academic experience and it makes sense to take classes that still count for academic credit since you’re paying the money! OIE made accessing these lists at the various programs very easy, so if your university does not offer such a nice website, you might have to do some digging to figure out their academic offerings! Want to learn more about housing at study abroad programs, coordinating accommodations, planning international travel, and more? Get my new e-book “Studying Abroad with Food Allergies” now, available exclusively on Amazon Kindle. Buy it here. I’m leaving on Monday, August 1st to study abroad! I’ll be traveling with friends for the entire month of August through Iceland, Spain, France, Italy, and Greece; then, I’ll be in Denmark for a month completing a research project; and then I’ll be at a host university in Lancaster, England from October to mid-December. Crazy times! I’m beyond excited to embark on this adventure of a lifetime. The planning for this process admittedly started before my Freshman year at college even began. I was excited! The University of Denver has an incredible set-up: during your junior or senior year, you can study abroad at any partner program or university (they have over 160) in over 80 countries around the world. You pay DU your normal tuition, housing, and fees and they take care of the costs at your host program or university! And, with a 3.0 GPA or higher, DU students can also qualify for the Cherrington Global Scholars program, which helps cover visa fees and flights to and from your program! Truly, DU makes it super easy to study abroad. I knew from the get-go (as I discussed in a previous post) that I would need to study in an English-speaking country where I would have control of my food intake — so homestay programs and shared kitchen set-ups wouldn’t work. I narrowed it down to a variety of programs in the UK, New Zealand, and Australia, but eventually settled on Lancaster University. It’s quite a good school and has a variety of academic + fun programs I can get involved in! I left all of the study abroad stuff on the backburner until this past fall, when all the study abroad applications begin. After investigating all of my options at Lancaster, I decided to pursue independent research. I had no idea (originally) what my research would be about but I knew it sounded cool and I wanted to take advantage of the opportunity of studying abroad. As a Public Policy major, I’m really interested in how different governments structure their economies, health care systems, and other public sector services. I mulled around a bit with the idea of looking into the National Health Service (NHS) in the UK since it’s so different from the US health care system; but, after doing a lot of research and reading (I kid you not I read three PhD dissertations and two books and forty-odd academic journal articles), I settled on conducting research in Denmark on the way they treat small & medium-sized businesses. I now knew that I would be spending a considerable amount of time in Denmark conducting this research and I would have to do it before my program began. Lancaster’s term starts late (the first few days of October), so I knew I had September to conduct my research. And then, I decided that traveling with friends sounded like a cool idea — why not? I’m over there already and my flights were paid for by DU. 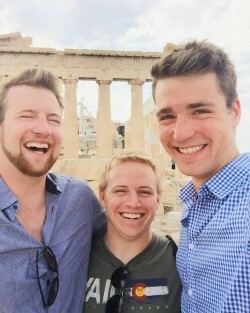 After many months of figuring out immigration issues and friends committing and then finding out they weren’t able to, my two close friends (Thomas, my first year roommate, and Danny — or DK for short) and I decided to travel together for all of August! We didn’t really have much planned until mid-May, but we knew we wanted to see a lot of Italy. I’ll be traveling with Thomas and DK through Iceland, Spain, France, Italy, and Greece. I’ll be staying in Copenhagen, Denmark for the full month of September. I’ll be attending my study abroad program at Lancaster from October to mid-December. I get home December 18th. I am blessed to have a full-ride scholarship to DU that helps pay for my study abroad experience at Lancaster. I also applied and was awarded grants to help fund my research in Denmark. I started saving over two years ago for my study abroad experience and am also using all my personal savings to help fund my travels and other fun excursions! The point being I started planning for this incredible experience a long time ago, both financially and mentally. This was a top priority for me from the get-go. I knew (from other bloggers and food allergy families) that international travel was completely possible, even if I didn’t speak all of the languages. My Spanish is a little rusty, and I definitely don’t know how to explain anything in French or Greek, so I knew I’d be flying blind. I admit, that’s scary! But, I knew I could prepare successfully for my travels abroad and remain 100% safe. I downloaded the Google Translate app, which can help translate things on the spot — you can even take a picture of something and it will translate it! I also downloaded AllergySmartz, an app for my iPhone that allows me to select my food allergens and it churns out a prepared chunk of text describing my food allergies & cross contact issues in multiple different languages to give to a waiter who may not be fully fluent in English. It’s essentially a digital chef card in multiple different languages! DU also helps its abroad students by automatically getting them membership to International SOS, a company that delivers 24/7 emergency help and advice. They don’t provide health services, but they can call an ambulance or help notify a US Embassy in case of a national security issue. DU requires all of its students call International SOS before they leave to get advice on health & safety while abroad. My call with International SOS was fantastic. After getting a security overview of all of the countries I was traveling to (and advice to watch out for pickpocketers and such), I got to speak with an actual medical doctor (!) about my food allergies and traveling abroad. He helped clarify that I should carry a doctor’s letter to get my medication through immigration (and what should be in that letter), to always watch out for cross-contact issues in restaurants, and to always carry my EpiPens. It was really great to talk to a doctor who was so knowledgeable on food allergies and travel. This is, in many regards, the ultimate test of self-advocacy. 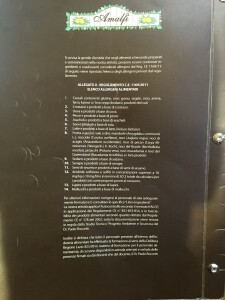 I’m already really quite good at advocating for myself, but to do it other countries and across languages certainly tests my own limits. My mom helped research potential issues in food overseas by reaching out through her various social media groups to figure out what other things could come up. I found out lupine flour, a flour used a lot in baking across Europe, cross reacts with nuts, and therefore isn’t good for me with peanut and tree nut allergies. Definitely going to avoid that! I have the absolute faith and confidence that I’ll be safe and I know how to take care of myself. 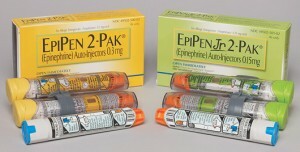 For medication, I’ll be carrying two EpiPens with me at all times, and I’ll have an extra two in my backpack. Because they have become so expensive, I’m traveling with EpiPens that are expiring in August of 2016 (this next month) – these are my two backups. We ordered the two new ones from Canada Drugs and got the MEDA brand, the European drug manufacturer of EpiPens, to make sure I was safe for all of my travels. They cost ~$220. I will be keeping the new ones with me. This is a definite risk, but from conversations with my allergist, the EpiPens won’t become extremely ineffective in the couple months past their expiration date. They may or may not be 100% effective, either, but we simply can’t afford to spend $220+ for a second new pair of EpiPens. I’ll also have other prescribed medication in my backpack at all times. I researched labeling laws for the EU and the UK. Thankfully, no regulations will be changing due to Brexit in the coming months, so I’m in a sweet spot to come to the UK (especially since the pound sterling is weaker against the dollar)! Over 85% of Danes speak fluent English, so I know I won’t have too many issues communicating in restaurants regarding my food allergies. However, most of their labels are solely in Danish. I’ve become familiar with important words (mainly my food allergies) in Danish to quickly identify those while reading labels in a grocery store. For the next 4+ months, I’ll basically only have a backpack’s worth of belongings. Since I’m traveling for the duration of August, I’ll only be carrying the things I absolutely need. Thomas, DK, and I are traveling mainly by trains, so I can’t be carrying around tons of luggage — it’s inconvenient, heavy, and unnecessary. I’ll have all the necessities, but nothing really more — clothes for different kinds of weather, some hiking shoes, flip flops, swimsuit, my medication, and some electronic & utility stuff, but that’s about it. For August, we’ll mainly be staying in hostels or AirBnB. We used HostelWorld to find the best hostels (stayed with hostels rated 8.5+ upon the advice of a friend). We were able to check their no pet & no smoking policies, plus cost and living situations. 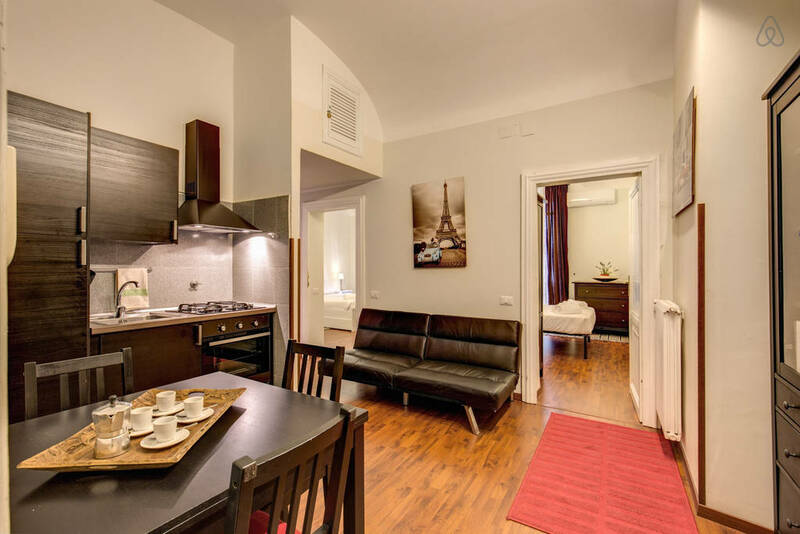 All of our AirBnBs were strategically placed in cities we were staying longer in: for example, we’re spending 5 nights in Rome, so we got an AirBnB so we could cook our own food if we wanted, wash clothes, and so forth. All of the AirBnB’s we chose are non-smoking and pet-free! 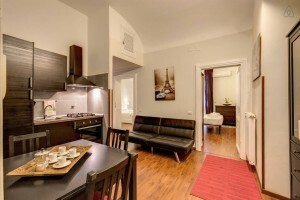 The AirBnB we’re staying in Rome — for only $90 / night! In Denmark, I’m renting an AirBnB for the whole month. It’s also pet-free and smoke-free and the owner is even giving me a bicycle to use while I’m there! Truly a wonderful set-up. It has a kitchen and a refrigerator and I get to truly take care of myself for that whole month! While in Lancaster, I’ll be staying in a studio dorm room. I’ll have a bed and bathroom and a small kitchenette to cook all of my food. I can take a short bus ride into Lancaster whenever I need to buy more food. It is also pet and smoke-free! I’ve prepared just like any other student studying abroad & traveling internationally — making copies of my credit cards, passport, immigration letters and documents, making sure my housing is set up at Lancaster, booking trains — and I also prepared as someone with food allergies. I’m going to be cautious. I’m not going to be eating crazy dishes without knowing, for certain, what will be in those dishes. And, I know, I’m going to have the time of my life! I’ll post an update probably once I get to Lancaster in October. Until then! I’m writing this sitting in Copenhagen, Denmark after traveling for 30 days through 11 cities in 5 countries. I started in Reykjavik, Iceland and ended in Athens, Greece and visited nearly everywhere in between. Needless to say, I’m a bit tired. This past month was fantastic. I cannot even begin to explain how much impact this last month has had upon me. I was a bit skeptical when everyone said “travel will change you in unimaginable ways.” Well, I can say with certainty, it does. This past month has also re-affirmed a sincerely held belief: having food allergies doesn’t limit you from anything. 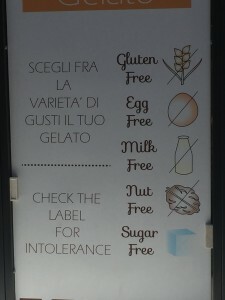 After ordering food in dozens of restaurants across Spain & France, eating gelato from the best shops in Italy, and having authentic Greek food in central Athens, I know that food allergies are simply another part of traveling. 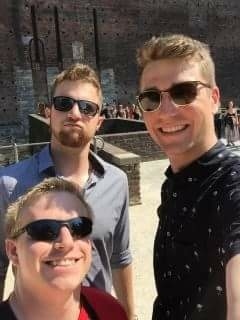 I traveled with Thomas (my first year roommate and best friend #1) and DK (best friend #2) for the month. They were absolutely hilarious to travel with and we had an absolute blast. Both Thomas and DK knew about my food allergies and were incredibly supportive and accommodating. They had been previously trained in how to use an EpiPen and were aware of cross contact issues. Most of the time, they were more worried about me being safe than I was! It would take too much space to give a detailed play-by-play of each meal in each city, so I will give a review of where I went and what I saw and then move on to the important takeaways and lessons from this amazing travel experience. Thomas & I flew out on August 1st and did a one-night stopover in Reykjavik, Iceland. It was our first city and it was a wonderful first stop. Even though we only had two full days in the city, we got to experience a very different city (in style and living) than most of Europe. If you have the chance, do a free stopover in Iceland with IcelandAir. They’re an excellent airline! We traveled via regional trains for the remainder of our journey. We departed in Reykjavik and entered mainland Europe, beginning with Barcelona. We spent three days in Barcelona and got a real taste of what it’s like to live there (hint: most people wake up past noon and stay out late). 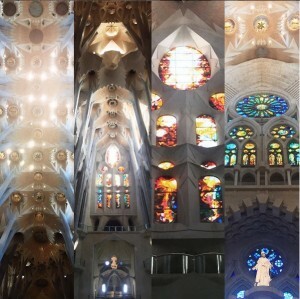 We got to see La Sagrada Familia, a huge cathedral designed by Antoni Gaudí that is still under construction! It’s world famous. But we also ate at markets, got to see the Mediterranean, and walk around a really great city. After Barcelona, we left to meet DK in Montpellier, France. With only one night, we only saw the main attractions: a cathedral, a large Arc de Triomphe and attached park, and the great medieval architecture. We got kicked out of our Airbnb (more on that later), so our time was cut a bit short. After Montpellier, we arrived in Marseille, France for two nights. We walked so much in Marseille, but we got see incredible views, churches, and history in France’s 2nd largest city. It was by far my favorite French city. After Marseille, we left for two nights in Nice, France — we mostly slept since we were recovering after Marseille and spent the rest of our day on the world famous beaches. As a note, there were armed French military patrols every 200 meters walking around the streets and along the beach due to their recent terrorist attacks. After Nice, we arrived in Milan, Italy after a brief 3-hour stopover in Genoa, Italy. We got to see the famous Il Duomo and three other incredibly historical churches, a medieval fortress, a museum, and ate world-famous pizza at Spontini Pizzeria. Our two nights in Milan felt really short but that’s mainly because we walked 12+ miles each day we were there! After Milan, DK went to see his cousin in Cinque Terre, a gorgeous coastal area of Northern Italy near Florence; Thomas and I went to Venice instead. Venice was by far my favorite city from the whole trip: picturesque canals, small shops and churches scattered all over the island, and a ton of history. We spent three nights in Venice. We met back up with DK in Florence and spent a short three nights in Florence. Florence was the ideal “Tuscan” city: a giant cathedral (the Florence Duomo) surrounded by red tile roofs in a picture-worthy valley. We spent most of our time in art galleries and museums (the Uffizi and the Accademia, where Michaelangelo’s David is held). We could’ve easily spent a week in Florence, partly because we found the best gelato shop in all of Italy! After Florence, we moved on to Rome. 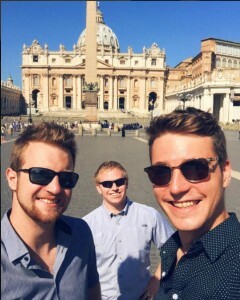 We spent a total of a week in Rome, but stayed in two different areas to add some variety. Our whole group got to see Pope Francis for his Sunday Angelus and now we can claim we have shirts blessed by the Pope! We also got to see all of the Vatican Museums and St. Peter’s Basilica, plus multiple museums and Roman historical sites. I ventured out to Tivoli, Italy by myself for a half-day in Villa D’Este, a 16th century villa with incredible gravity-operated fountains. After 7 days in Rome, we were definitely exhausted. But no matter! We hopped on a short plane to Athens, Greece (via Aegean Air, another excellent airline) to conclude our trip. By this point, we were pretty darn tired so we split our days between relaxation and seeing historical sights. Still, we got to see a plethora of Ancient Greek history sites and museums. Upon reflection, Thomas and I realized we kind of moved “backwards” in history — Iceland was the “newest” country, founded in about 800 CE. And we moved all the way back to the cradle of Western civilization in Athens, Greece, which dates as early as 8,000 BCE. 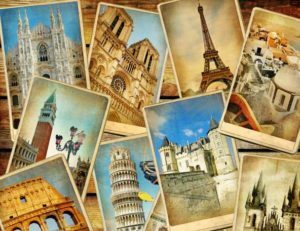 It was an incredible journey through history and through Europe! We got kicked out of our Airbnb in Montpellier. This isn’t as bad as it sounds, but it is fun to say. Our host said we needed to be out of the Airbnb before “12am” — knowing that many Europeans (especially those less fluent in English) could mistake 12am with 12pm, I asked him if he meant 12am or noon. He re-affirmed 12am. As it turned out, he meant 12pm. Most of the French (and elsewhere) use 24h time, so time after 12h is expressed as 13h–23h instead of 1pm to 11pm. It was a simple mess-up, but his cleaning lady came a-knocking at 12pm. Luckily, we were there by accident since DK needed to grab his water bottle! Unfortunately, his cleaning lady didn’t speak any English so we roughly communicated through Google Translate to figure out why she was there and how much time we had to leave (about 1 minute). We hastily packed everything and ran out apologizing (Je suis désolé !). We explored Montpellier with all of our stuff on our backs until our train left for Marseille. We were in a restaurant in Marseille, France and I decided to have a dessert — creme brulee! It’s a classic French dessert and it’s really a set recipe. However, their creme brulee was served with a side of raspberry sauce and almonds. I asked for them to leave off the almonds on the side. Thomas and DK got a separate dessert — but when they came to serve the desserts, they didn’t get Thomas or DK’s right (they served them the wrong dessert) so I had an “OH BOY” kind of moment, waiting for the creme brulee to come out with nuts on the side. They actually first entirely forgot about my dessert for about 5 minutes once they corrected their previous mistake with Thomas and DK, but they eventually got it out and it was completely safe, no nuts anywhere. Obviously I had a couple run-ins with danger, but there were far more successes. Every meal I ate while traveling, which meant about 90 meals were entirely safe at a variety of restaurants in a variety of countries, explained to servers who weren’t usually fluent in English. So, I only had two mix-ups out of 90 — that’s a stellar record. I ordered a a simple peach tart in Nice — basically baked peaches with a peach sauce. The waiter actually double checked with three cooks about the processing of the peaches before he came back to the table and informed me that the peaches have cross contact issues in their kitchen with nuts they use in other dishes. How incredible! This restaurant in Venice! This restaurant in Rome! Those are some highlights (and I actually just realized while writing this that all of those moments were from Italy). Every waiter in Europe that I’ve explained my food allergies to completely gets it. They don’t ignore it and they double check with the kitchen on my meals. Really, truly good service even with a slight language barrier. There was a lot I knew coming into my travels. I planned for months in advance for which cities we were visiting and where we were staying. I double checked airline policies for serving nuts (Iceland Air and Aegean Air are two fantastic airlines). I knew I would have to avoid chocolate at all costs because chocolate is usually made with nuts across Europe, and I would avoid it even if they told me their chocolate wasn’t. I even checked immigration restrictions on medicine and bringing EpiPens® into different countries. Never, ever, ever believe your food allergies are an inconvenience. Thomas and DK were wonderful companions and always supportive in finding restaurants with safe menus. After walking 10 miles in Venice one day, Thomas and I were famished and we found a good looking restaurant, but about 75% of their menu was solely seafood (which Thomas enjoys). I didn’t feel totally comfortable with the place even though I could eat there, but it was Thomas who was the really uncomfortable one since he didn’t want us eating there for my sake — how’s that for great friends! He decisively said “no, let’s find somewhere else.” We did. Never convince yourself or your friends that it’s okay to put yourself in danger, because it’s not. Always restate your food allergies to the waiter multiple times while ordering. Before I ordered, I would tell them “I have food allergies. All peanuts and nuts, sesame, shellfish, and fish,” in English. If they looked confused or weren’t totally fluent in English, I’d pull out my phone and show them the list in whatever language they spoke. Then I’d order my food. Then I’d restate my food allergies. By that point, the waiter or waitress was like “yes, yes I got it,” which made me feel even safer! Carry all your important documentation in one area and have digital copies available. I feel as if this is a good travel tip in general, but especially for those of us with food allergies. I had a bright red folder in my daypack (that I carried on to flights as well) that contained copies of doctor’s letters for immigration that allow me to carry my medicine, my passport, all of my credit cards and ID cards including health insurance, a copy of proof of health insurance, and a copy of bank statements (really for my travels in the UK). I had all of these documents also saved digitally so I could print them out if necessary. I also had printed verifications of everywhere we were going to stay (AirBnB’s and Hostels) along with flight confirmation information. This way, I had any and all information I needed at anytime I needed it on my person. In case it was stolen, I also had digital copies I could print out. If you want control over your meals, use AirBnB. I should become some sort of brand rep for their company because I absolutely adore AirBnB. Basically, you can “rent” out another person’s apartment or a room in their apartment for as long as you would like. There are hundreds of options in each city. We stayed with top-reviewed places and top-reviewed hosts (called SuperHosts) so we assured our experience would be a good one. Through AirBnB, we stayed in an apartment in a 13th century monastery, a 5th floor apartment with a grand view of Marseille, a first floor apartment with a river view in Florence, a gorgeous apartment near the Vatican, and a top-floor apartment with a rooftop view of Rome. Oh and a spacious apartment in Athens that had a view of the Olympian Temple of Zeus. And for the most part, we didn’t spend more than $30 or $40 per person, per night. When shared between three people, it becomes really quite cheap to travel via AirBnB. Since you have access to a kitchen, you can cook or at least have a place to store food you can eat at anytime. We stayed in our fair share of hostels, but they’re simply not as flexible or easy to use for food. Bring an emergency supply of snacks. This should be a small bag of some kind of emergency food. I always bring NutriGrain bars, and those staved off hunger on a couple of train rides. You might end up in a situation where you can’t eat safely or you need to catch a train instead of eating due to bad planning (did that one…). It’s always good to have a guaranteed safe option available. Please always carry your epinephrine autoinjectors. That’s a no brainer. I could probably write pages and pages more — and I just might eventually! For now, those are the top takeaways. After Greece, Thomas and DK left for Zurich, Switzerland to meet DK’s family. They’ll be finally settling down in Salzburg, Austria for their study abroad program in the next couple of days. I left for Copenhagen, Denmark where I am now completing a research project on small business performance and growth. International travel can seem scary, I totally get that. I had a lot of fears about communicating with different people in different languages and still feel that the food served would be “safe.” But, it is entirely possible. You have to plan ahead, of course, but once you’re there, you have to figure it out somehow. If you explain you have food allergies, you may be surprised at how many people are willing to help and make sure the food is going to be safe and delicious. You can always figure a way to make it work! Simply: Food allergies do not prevent you from doing anything in life, unless you let them. Questions about travel or study abroad programs? Send me an e-mail at morgan@allergicchild.com. I’d be happy to answer any and all questions you have about my travels or about planning for yours! 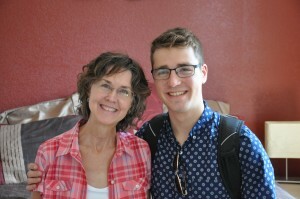 Many of you have read my son, Morgan’s, recent posts about studying abroad with food allergies. If you’ve missed them, please read them on his Morgan’s New Corner blog here and here. He wrote extensively about the details of what it took for him to be able to study abroad safely. He will be traveling throughout Iceland, Spain, France, Italy & Greece in August; doing research in Copenhagen, Denmark in September, and studying at the University of Lancaster in Britain from October through December 18. As a parent, it was difficult to wrap my head around him studying abroad when he first brought up the subject prior to leaving for college. 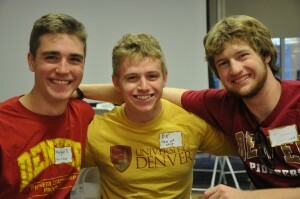 At the University of Denver, approximately 70% of the students study abroad – generally in their junior year. There were seminars about studying abroad for parents to attend during the Parent portion of the Freshman Orientation Week. I sat through those discussions and wondered how we, my husband and I, would ever be able to support this endeavor! Yet we both agreed that this was an opportunity not to be missed, if it was possible. It was going to take plenty of preparation, but the good news was – Morgan would be doing that instead of me!! Over the past 2 years of college, Morgan has shown more maturity in being able to handle the details of his medical care. He has also become far more organized, and took on looking into the schools abroad that could accommodate his needs for safe food. Since middle school, he has been responsible for ALWAYS carrying his EpiPen 2-Pak, which he does ALWAYS. He knows how to recognize an allergic reaction in himself, and how to teach others. He can also teach others how to administer his EpiPen. He has vast experience with traveling by himself, and in groups, and keeping himself safe. Since he doesn’t speak a second language, we knew that he would need to have an English speaking country for his study abroad, and thankfully he agreed with that wholeheartedly. I remember speaking with a father at a Parent’s Weekend at DU who was telling me that his son went to Australia for study abroad and loved it. He then mentioned that his son has a peanut allergy. I commented that it was probably easier to manage his peanut allergy in an English speaking country. The Dad said that he’d never thought of that! For some parents of children with food allergies, there is a different level of vigilance than what we’ve practiced. We have chosen the vigilant lifestyle, based upon Morgan’s past allergic reactions. I can’t imagine being cavalier about where Morgan chose to study. It was also important, however, that Morgan take responsibility for ALL parts of the study abroad. This included whether the college/university had classes that would fit into his major; whether he could find a living arrangement that would keep him safe; and which airline he would choose to fly to his various destinations. There are so many pieces of this puzzle to put together, and we allowed him to be the Project Manager of this adventure. He learned about an app called Trello that he was using with another project at school. This became our go-to place for listing all the details of what needed to be done prior to his departure. He would list various items that he knew he needed to provide to get into the country; and I listed other items important to me. Together we made it happen, and I also had to quit micro-detailing him to death. At 20 years old, he had shown how responsible he was, and I needed to trust that whatever happens abroad is for his highest and best good. Yesterday, we took him to Denver International Airport. I couldn’t believe that we were at the launch point! The years of teaching him how to be safe with food allergies were going to get the biggest test yet. He has a written plan for the cities he will be visiting detailing where he’s staying, and he’s checked out various markets and restaurants. He’s going to purchase a SIM card in each of the countries he’s visiting to be able to communicate with us and with others. We will be communicating through Skype while he is abroad, however he told me to expect a weekly update – not daily! He will provide a map “touch point” every time he enters into a new city while traveling during August. This will allow us to know he has safely arrived. He also provided us with his detailed itinerary for the month of August, so we know where he’s planning on being. He’s traveling with two DU friends – one of whom flew with him. The other one, they will meet in France. It’s not easy to allow our children to grow up and participate in college life! I cried many a tear yesterday, and hugged him three different times before he got on the escalator to head to TSA. I’m so excited for this adventure for him. And I’ve already counted the days until his return – 139 to go! 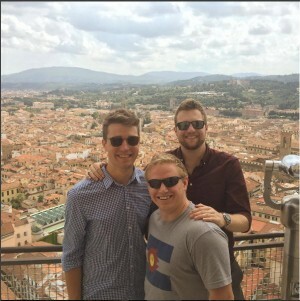 Studying Abroad is a rite of passage at the University of Denver, where I attend college. There are numerous steps for every student to prepare appropriately for being in another country for a school quarter or semester. For me, adding food allergies into the mix, generates even more necessary preparation! Unless I magically became fluent in another language, I would need to go to an English-speaking country. The language barrier present in trying to explain my food allergies to chefs or other people in a country that does not predominantly speak English would be a challenge that puts my life at risk. That was unacceptable so I knew I would have to look at an English-speaking country in which to study abroad. I could not do a homestay program. This is especially true in non-English speaking countries. In a homestay, I would have little to no control over the food served and thus would be putting myself in danger. I knew a homestay would not work. Most importantly, I would have to find a university or program that had classes that interested me and was in a country that interested me! I wouldn’t want to study abroad in a country that I didn’t like or at a university/program that offered no classes that interested me. That wouldn’t be fun and I want to have fun while studying abroad. I found a few programs around the world in the UK, Australia, and Ireland that interested me. After narrowing it down, I found an awesome program at Lancaster University in the United Kingdom. It’s about 3 hours away from London (by train) in rural England and it’s ranked as a pretty good university! Because I love to plan ahead, I knew this was the program I wanted to attend before I even started school my freshman year (last year). It had all of the academic courses that I desired, and the housing was on the university campus with access to a kitchen. I did a bit more research into the program at Lancaster during the winter & spring of my freshman year and realized that the dormitory system may throw a wrench in my plans. Lancaster is set-up in a college system. Each college has its own dining hall, common areas, and living spaces. The majority of the dorms were set-up in a shared kitchen style, meaning that food would be stored in a shared refrigerator (or two) and everyone would have access to the same pots and pans to cook. That posed a lot of cross-contact issues both in storing and preparing food. I knew that I could probably buy my own pans and pots while I’m there, but I couldn’t mitigate contact between my food and other people’s in the same refrigerator. I made a judgment call and determined I didn’t feel safe with that option. I found that some colleges have a “private ensuite” option: I have a kitchen and storage and a bed all to myself in my own self-contained suite. This mitigates a lot of the issues that could arise in a shared kitchen facility. I became really excited since I knew that the option was available! I just had to find out if I could secure a “private ensuite” while I study abroad. I dug into Lancaster’s website and found their disability office contact. I sent an e-mail with my concerns (explaining my food allergies, their severity, the problems with shared kitchen facilities, and the possibility of a private ensuite). I heard back from the office and they said that it was a definite possibility! They remarked that it wasn’t a preferred set-up for a study abroad student simply because it limited my social interactions with other people, but they said my health always trumps those concerns. I was really excited. I knew that I could study abroad and find safe housing at my host university. I started to research labeling laws for the UK and got some help from the Anaphylaxis Campaign in the UK in identifying the regulations. Since the UK is a member of the European Union (EU), the EU’s regulations apply to all UK manufacturers and producers. At the University of Denver, the Office of International Education (OIE) supervises all of the study abroad programs. Students get a study abroad advisor depending upon their country and that advisor helps answer any questions regarding studying abroad and helps coordinate all of the application process. I told my OIE contact person about my food allergies and why homestay/shared kitchens would not work. I wanted to reconfirm through him and his contacts at Lancaster that a private ensuite option would be available for studying abroad. The staff at Lancaster confirmed this! I would need to submit some medical documentation, coordinate with the disability office, and include the request on my study abroad application, but otherwise, everything was a go! 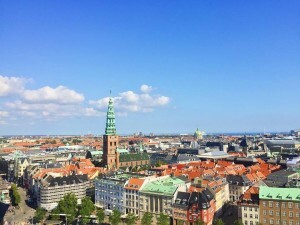 After spending the last few months coordinating with OIE, my academic advisors, and Lancaster University, I decided to add a month of research in Copenhagen Denmark, prior to the start of the school quarter at Lancaster. The research will be within my two majors: economics and public policy. Denmark is also, technically, an English-speaking country. 86% of Danes are fluent English speakers, meaning that I won’t have problems assuring my safety in urban areas. I’m still securing a lot of the details around my research since it is a relatively new adventure! I know I’ll be staying in a no-pet and no-smoking Airbnb in Copenhagen for the month, with access to a fully-furnished kitchen. This makes it really easy to make sure I’m safe: I buy all of my own food and cook it myself! I’m still researching labeling laws in Denmark, but given that they are members of the EU as well, I’m sure their regulations are very similar to the UK’s. I’m so excited to have this opportunity to study abroad, and to do so with my food allergies handled in a way that makes me feel safe!